After celebrating 50 million DS consoles sold in the United States, Nintendo's venerable dual-screened handheld is closing in on another milestone: 150m units sold around the globe. The company's latest financial results show the system sitting on 149m consoles sold since its release in 2004 to the end of September 2011. Software sales have been similarly impressive, of course: while DS software was down nearly 50% year on year, it still mustered 28.9m games sold between April and September. Life to date, a grey-matter-frying 868.48 million games have made their way into the hands of DS owners. Sweet. Now where can I find that cake? Dragon Quest IX is the best DS game ever. This better pass the PS2! @rudydog13 It's from Tesco in the UK, I've had that cake on my birthday for three years in a row lol. Hey, I had that cake for my birthday once! 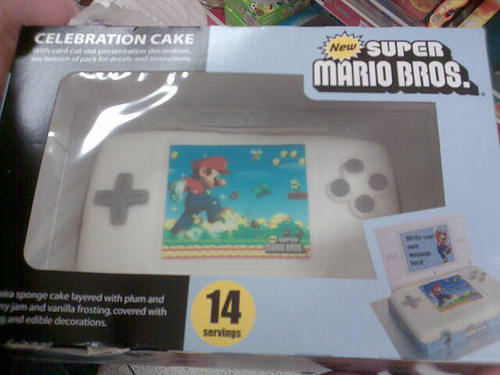 they sell that cake in asda as well! the DS has been a massive success and due to some of the best titles to grace the system, it deserves to be successful. That cake looks good. Is it a regular cake or an ice cream cake? The DS has already passed ps2 sales. DS is all about games and ps2 is more of a game, cd, dvd player. Whoever says that cake is new its not! Its been on sale since 2006 and they make it in UK market shops. Lot of units, congrats Nintendo.